Part Time Evil, a small studio whose members have worked in projects like MechAssault 2, Fracture, Darksiders 1 and 2, Blacksite: Area 51, Boomblox, Night at the Museum, and UFC Undisputed, have today revealed that Zig Zag Zombie, an addictive physics puzzler game is now available on the App Store. 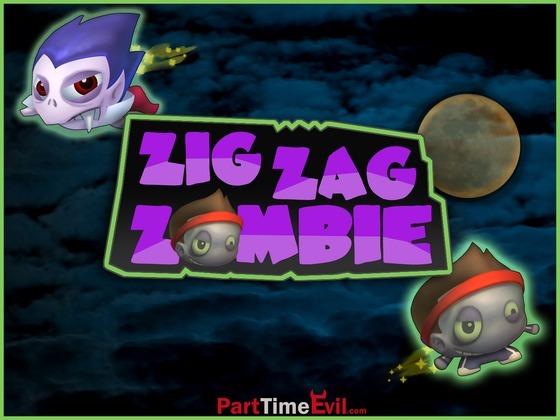 Zig Zag Zombie which features 60 Levels, and three different worlds, Monster School, Ghost Graveyard, and Evil Lab, lets gamers join a Zombie, a Frankenstein monster, a ghost, a missile creature, and their human friend, Zora on a fun quest. The unique feature in this physics puzzler is called “radial aiming” in which the player drags the monsters in circle to aim then in 360 degrees, then presses “Go” to launch! Each monster has a power that interacts with the environment, which leads to some very creative puzzle solutions, some of which require monsters to help each other. Zig Zag Zombie is available on the iPhone, iPod, and iPad in free and paid versions.